Umpf picked up its second ‘Social Media Agency of the Year’ award at a ceremony in London last week. 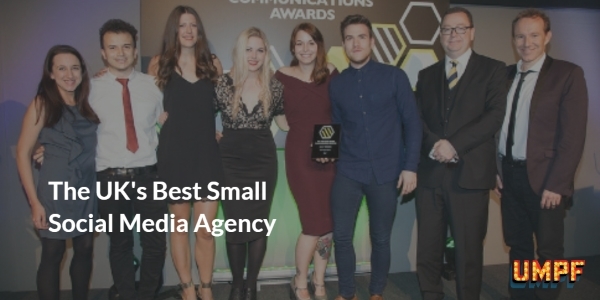 Umpf was named the UK’s Best Small Social Media Agency at the UK Social Media Communications Awards 2015. The awards, held at Arsenal’s Emirates Stadium last Thursday evening, recognise the very best in UK social media. Earlier this year, in March, Umpf was named Social Media Agency of the Year at the PR Moment Awards in Manchester. 🔸In September Umpf’s campaign for Park Inn by Radisson was runner-up in the Best European Content Marketing Campaign category at the Digital Communications Awards in Berlin. 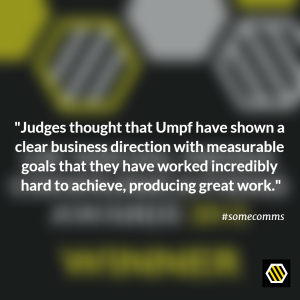 🔸Next month Umpf is up for eight gongs – including another Social Media Agency of the Year nomination – at the Social Buzz Awards in London. An amazing year so far for Umpf – Social Media Agency of the Year (x2). More on our PR and social media awards, here.